Today was a minimum day at work, not only does that mean I work a half day, but that I can wear some of my highest heels because I will be on my feet less so they will hurt less at the end of the day. Yes, I think about things like that. I plan my outfits very strategically. My sister left a comment on my Moving Shoes #23. She asked, "You are still moving shoe? My goodness, how many pairs do you have?" I am maybe halfway through all my shoes, but many of my shoes are sandal too. I have one more pair of boots to wear and a few flats, but I do have a lot of sandals too so I might be doing another moving shoes in the Spring/Summer to get through all those...although I don't get dressed all the often in the Summer. I wear a bathing suit most days...we will see. 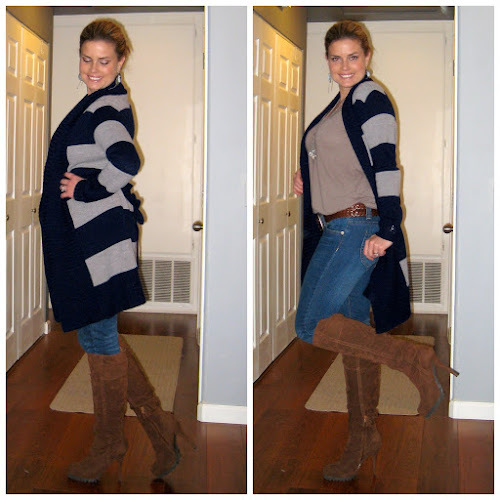 These knee-high suede boots were purchased from Cutesygirl. I purchased them recently, just about 3 months ago or so. I am wearing super skinny jeans from Angle, a long striped sweater from Alloy and a taupe loose fit t-shirt from Old Navy. The belt is from Target. The necklace is the same one I wore here. The earrings are from the LA Fashion district, and yes I got them for $1. I've always loved that sweater in Alloy. You look super skinny in that outfit! Good for you on those shoes!!! There is no way I could ever pull off high heels at school, but I guess a minimum day is as good as any to try! Love the shoes and the cardigan! I just found your blog, and I think that this outfit is casual yet stunning! I wish I could pull this off! I want that cardigan sweater so I can live in it! Adorable and looks so cozy!! I'm in love with this outfit!! oooh, i love that sweater! i'm a sucker for chunky stripes. and the neutral colors are awesome. great look! Love those Jeans, really like them on u. They look great!